Feral's Brewpub Series sees them, on occasion, pluck a favourite beer from the many that have previously graced the taps at their Swan Valley brewpub (and often not too many other places). 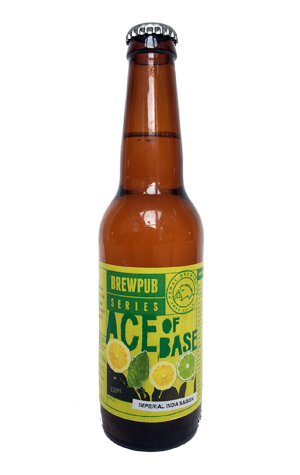 For winter 2016, they went back a little in time and opted for Ace of Base, a beer that, in typical Feral fashion, isn't the sort you might expect to see in the colder months and that, in typical Feral "styles be damned" fashion, they've tagged an "imperial India saison" for its bottle release. It's a beer that puts the divisive Sorachi Ace hop of Japanese origin front and centre; indeed, Feral was one of the first breweries to play around with the hop when it first arrived in Australia since when it's most typically found a home within spicier, farmhouse influenced ales. Here it sits in rather large quantities in a beer that has to be one of the boozier saisons to come out of Australia (BentSpoke's double digit PSI being the biggest we can recall). It looks not too dissimilar to a Bellini cocktail in the glass, thanks to its peachy haze and white head. The Sorachi contributes distinctive lemon citrus and botanical qualities, while there's hints of pine and even soapy lemon dishwasher liquid; little wonder it's a divisive hop... Malt sweetness and the spicy, drying elements of the saison yeast complete the picture, along with the warming qualities that come with 8.3 percent ABV.